These are 10mm Apple Green Round Cloisonne Bead, 6 beads in a bag. These are 10mm Black Round Cloisonne Bead, 6 beads in a bag. 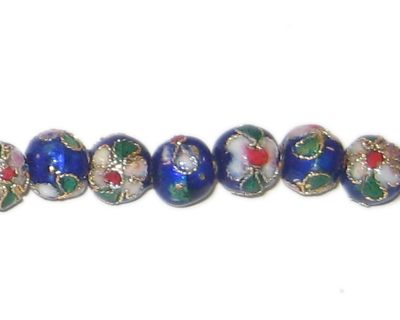 These are 10mm Gold Round Cloisonne Beads - 6 beads. These are 10mm Red Round Cloisonne Bead, 6 beads in a bag. These are 10mm White Round Cloisonne Bead, 6 beads in a bag. These are 12mm Pink Round Cloisonne Beads - 4 beads in a bag. These are 12mm White Round Cloisonne Beads - 4 beads in a bag. These are 4mm Black Round Cloisonne Bead, 10 beads in a bag. These are 4mm Blue Round Cloisonne Bead, 10 beads in a bag. These are 4mm Turquoise Round Cloisonne Bead, 10 beads in a bag. These are 4mm White Round Cloisonne Bead, 10 beads in a bag. These are 6mm Emerald Round Cloisonne Bead, 7 beads in a bag. These are 6mm Pink Round Cloisonne Bead, 7 beads in a bag. These are 6mm Turquoise Round Cloisonne Bead, 7 beads in a bag. These are 8mm Blue Round Cloisonne Beads, 7 beads. These are 8mm Emerald Round Cloisonne Beads, 6 beads. These are 8mm Pink Round Cloisonne Bead, 6 beads in a bag. My first order and I was very satisfied with the contents. My second order is on its way. Loving it! !